Too many people of all ages are constantly bullied. This needs to stop and for this reason, 25% of the proceeds from all sales of this book will go directly to the It Gets Better Project. Far too many people are committing suicide because of the way they are treated, bullied and simply because of their sexuality for various reasons and causes. For this reason, 25% of the proceeds from all sales of this book will go directly to The Trevor Project. I have watched a few too many friends and even strangers suffer because of HIV and AIDS and even more pass away, their lives cut short by an illness that ravages everything it touches. For this reason, 25% of the proceeds from all sales of this book will go directly to Broadway Cares/Equity Fights AIDS. A good many of our authors, including us here at Lazy Beagle Entertainment, have pets of all types. Every single pet that Rondal and I (Patrick) have ever had has been a rescue from one source or another. We view our pets as living beings, not things to be owned or possessed though they possess our love and hearts and us theirs. Lazy Beagle Entertainment was named such because of our twin Beagle Boys named Archie Goodwin and Nero Wolfe. Archie passed away on March 9, 2013 after a five year battle from complications due to cancer. Animals are children in a way and we view them as such. No animal deserves to be treated cruelly or like a possession. For this reason, 25% of the proceeds from all sales of this book will go directly to The Humane Society of the United States. All 100% of the proceeds from the sales of this book will be going directly to these four charities. 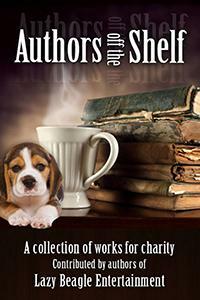 None of the authors, Lazy Beagle Entertainment, Rondal or Patrick will receive any profit. (Unfortunately we can’t stop the companies selling the book from receiving a profit when they sell the book.) You may also donate directly to these charities by accessing their websites.